I will be posting a very favorable review to Trip Advisor in the coming days – be on the lookout for it. The City Tour was great! Charl was really kind and informative! Cape Town is beautiful! Thanks, Warren, for accommodating us with little notice. We had a great day with Charlie--he did a nice job sharing history, local facts and culture in an interesting way for the whole family. We traveled at a nice pace and, even with the summer traffic, he kept us entertained. What an enjoyable trip! Just wanted to let you know we had a fantastic day yesterday and the early start made a lot easier by Chris. He was a fantastic guide and his manner and attention to detail were superb. His photography skills were also much appreciated! We would definitely use your company again when we return to Cape Town and won't hesitate to recommend you to our friends and family. I wanted you to know Ludumo Dwaba was a superb guide; intelligent, helpful and shared so much information with my husband and I and made this day tour SO very memorable for us. We will highly recommend your company to our friends because of him. This is just a note to thank you for looking after me so well and making my recent stop-over in Cape Town so enjoyable. The airport transfer was very efficient and your recommendation of staying at a Waterfront hotel was perfect - I spent my first afternoon very happily exploring the area and eating some Biltong in memory of my father. Dion was the best guide and gave me a most enjoyable and thorough tour of the city - he was very knowledgeable and happy to discuss everything from the local wildlife to politics. He kindly took me to Camps Bay, where I had lived in my infancy with my family, and waited patiently while I walked on the white sand that my father had told me about. Dion gave further valuable advice about my flight transfers and upcoming riding safari in Botswana and he even stopped along a road, having remembered that I had expressed a wish to photograph a flowering Proteus, so that I could jump out briefly with my camera. It was a pity that the weather was too windy for the cable car up Table Mountain, but perhaps that would be a good reason to return! My children have expressed a wish to visit Cape Town when I reach a big birthday in a few years' time and I will come straight to you to book a Garden Route Tour for us all. I write to express my thanks on an excellent Private tour I took with your Company on Saturday 12th November. My tour guide, Dion, was very helpful and extremely well informed. All aspects of the tour were very interesting and memorable and worthy of the many photos I took. My compliments of the season to you and your team. Hi Warren: Dave and I are home from our wonderful travels in South Africa. Wow, what a trip! Just wanted to take the time and let you know what a great time we had on all three days of our tours. As you know, we had our guide, Chris, for all of the three days, and Dave and I felt so lucky to have had him with us and to have met him. He is an amazing guide/person, knowledgeable – and funny! Chris made sure that we got to do all that we wanted to do (and for however long we wanted to do it… i.e., a little longer with the penquins!). We so enjoyed taking tours with just the two of us and Chris, as we got to stop whenever/wherever for pictures, snacks, lunch. Chris even stopped at a local market one morning and bought us some local favorites for the car ride. As you know, the whale watching at Hermanus got cancelled because of the monsoon, but Chris quickly changed plans and off we went to a fun restaurant for lunch (where we all got quite drenched! ), and then an additional wine tasting for the afternoon. Quite impressed with the South African wines, and am happy to know that our local wine market stocks many of the vineyards we visited. Warren, quite seriously, our three days in Cape Town (with wonderful Chris) were highlights of our trip to South Africa. Cape Town and its vicinities are beautiful, and the people are lovely. You have a very beautiful country and Dave and I will be back. Please tell Chris we said hello and pass on to him how much we enjoyed traveling about with him. Just to say we really enjoyed the tour today. Fantastic with a great guide. Will recommend to anybody we know coming to Cape Town. Excellent! Thanks so much again for such a wonderful and fun your. Jess and I thoroughly enjoyed it! We'll enjoy the mountain and the wine country before we head back. I just want to take a moment to thank you for all you did to make our stay in Cape Town so wonderful and memorable. We had come off a 2 week safari that was fantastic and it was truly a hard act to follow. Your tours succeeded. All 3 were great and we can't say enough about how good a job Leonard did to make them so. His knowledge and sense of humor were so evident. I also want to thank you for the complimentary wine tour. We really enjoyed it. We live in wine country in the States, but I have not been to a winery to compare to Ernie Ells. Once I recover from our long flight back, I will be sure to write an extremely positive comment on Tripadviser. We just wanted to rave about our tour yesterday. Despite the whale watching being unsuccessful due to the weather, we had a fantastic time! The trip out to Hermanus was beautiful and Dion was simply amazing! He was so friendly, personable and such a great tour guide. He tried so hard for us to see whales but the weather wasn't co-operating but made sure we had an amazing time regardless. We had a great day out. Can't wait to come back with your company and do it again! would just like to say a 'thank you' for our trip last week especially as we had our own personal driver for the day from Hylton Ross(not sure of spelling). Successfully saw the whales but really can't praise our driver enough (his name was Carlos) as he was so informative and took his time to ensure we had a great day. If you could pass that on to his company please? And we also took him up on his advising us to visit the Beluga restaurant in the Foundry behind our hotel. We just wanted to give you some positive feedback about our day trip on 2 June. We had a fantastic time, and this was due largely to Mario. He was a great host, really enthusiastic and engaging, in fact completely delightful. Thanks again for the great day. We had a lovely day yesterday thanks to Greg. He was very friendly, knowledgeable and made our trip really memorable, despite the unfortunate weather and things being out of his (and your) control. You are living in a beautiful city and surrounds. We thoroughly enjoyed our tours. Sorry to miss the island but really enjoyed the rest of the day. Strongest winds I've ever been in!!! I will highly recommend your company. Our guides were great. a) Transport size is just nice. Sufficient space for 9 of us & our luggage & golf bags. Glad to have a small fridge in the mini bus. b) Committed & skilful driver – The driver, Ian is simply amazing, a lot of initiative, resourceful, punctual, careful driver, chatty. c) Excellent & profession guide – Peter Edge is the best guide, one can ask for. He shared to us alot of stories and gave us many insights of South Africa. He even gave us a book to read, The Covenant. We hope he can be our guide for our future trip to South Africa again. d) Safari day tour & the Cape of Good Hope tour was very well arranged. It’s a pity it rained, else we could have covered Table Mountain too. e) All the transfers ( route well planned & timing good & some freebies ) required are very well carried out. bananas for golfers. Ian help us to get us bottled water which was good. Will definitely recommend your tour service to my Singapore friends. I will definitely engage your service again if I go back to Cape Town again. I think your company can go into golf tour arrangements too. You know quite well the requirements. Very satisfied customer/Silas Heng – Singapore Group. Thot : Beware – Africa is addictive…………..how true ! I just wanted to send you an email to praise your guide Thabiso for a job well done - he was great and made our brief stay in Capetown very pleasurable. Having settled back into the daily grind, I wanted to take the time to thank you and your team for helping to make our trip to Cape Town a very memorable experience. Putting my total faith in Cape Town Tours proved to be the right decision. From the moment Greg arrived at our hotel to take our party of 8 to Robben Island, we knew we were in the best possible hands. Greg was very engaging, knowledgeable and conscientious. He ensured we made the most of each experience, learnt as much about the country as we desired and added in little extras where possible. The same could be said of day two, on Safari. We all had a fantastic time in South Africa and I have no doubt that much of that was attributed to the organised tours you provided. great day at Cape Town and its environs. Just wanted to let you know how much we enjoyed our trips with Dion & Enrico while we were in Cape Town. It was our first visit and we loved it! Hope to return! Many thanks again for brilliant organisation. Just wanted to pen a brief note to place on record our 100% satisfaction with your services. We are well aware from previous experiences that your industry has its share of ‘cowboy’ operators. In contrast however we found your admin to be highly-efficient & your drivers to be smart, punctual & professional – we would not hesitate to recommend your services to others. Thought I would just send an e mail to thank you for the tours that you organised for me on our recent visit to Cape Town, I could not have wished for anything better. The service you give is second to non and I would have no hesitation in recommending you to anyone. Everything was spot on and I would particularly like to thank Andre our guide on our first weekend visits – no queuing with that man!!!! And such a lovely lunch venue he took us to. If we are ever in Cape Town again I will be in touch. I have a good time in cape town. Tq for making my trip a safe and enyoyable one. Going back to malaysia tomorrow. Finally with our feet back on the ground in the UK (arriving to temperatures at -4C), I wanted to drop you a note to thank you for organising our superb holiday in South Africa. It all went like clockwork and we loved every minute. The accommodation was superb. There was a great variety and certainly we would not have found some of the gems like Auberge Clermont and Fernery Lodge had we been booking direct. We absolutely loved Fernery and if we could have changed one thing about our trip, we would have stayed there longer. Shamwari was also fabulous and we saw all the animals we could have imagined and more. Finally last, but totally not least, Leonard was a superb guide. We couldn’t have requested anyone who could have been better, with his astute insight, love and pride in his the geography of his country, total courtesy and safe driving. Highly recommended. I will be making similar comments on Trip Advisor and your Facebook page but wanted to send a personal email. I think I told you that my sister who lives in Australia is contemplating making similar trip this time next year so if she does, I will ensure she has your contact details. Please use us as a reference in the future if required. We have been back in the cold, damp UK for nearly a week now – It seems impossible that it is almost a fortnight since we had our two days with your guides Darroll and Dion. · We had a marvellous day with Dion. The formal “itinerary” was delivered with aplomb, and constantly flexed to meet our wishes. Dion had more time to talk to us and he provided much added value explaining his experiences growing up and the current political and economic situation. My wife and I, having been to South Africa a couple of times had some understanding but Dion added hugely to it and ensured that our sons and their girlfriends returned home with a clear picture of your wonderful country’s history and current position. Thank you very much. We would not hesitate to recommend Cape Town Day Tours to any friends visiting your marvellous city. Thank you for our tour on Thursday. It was brilliant. We were disappointed at first to miss table mountain. However Greg gave us an amazing day. We saw so much and he was fabulous. Really one of the best tours we have ever done. His local knowledge was superb and he gave us a day to remember. We will definitely be back to Cape Town and look forward to doing table mountain next time. I just wanted to leave a reference for the great tour we had with Dion. He was a very friendly and knowledgeable guide who was happy to answer any and all questions. The tour itself was great - a lot to see! Thanks again for organising all this. Have a great new year!. Wanted to let you know that we had a great tour with Dion to the Cape of Good Hope. He was a wealth of information and very accommodating. Thanks to you and him for being so flexible with our departure time from the ship. Capetown was beautiful and the Cape Point tour was a highlight for sure!! her knowledge of everything no matter what we asked was excellent. beautiful country and are blessed with a lovely climate. Again many thanks for the planning you gave us. We have been home now for about a week after spending time in Livingstone, Zambia following our trip to Cape Town. We have just about caught up with ourselves so I thought I would drop you a line to say how much we enjoyed the three day tours you organised for us whilst we were in Cape Town. Lauren was a joy. She was attentive to our needs and catered for our wants whilst also being very personable and informative. Our first tour, City Orientation, Table Mountain & Robben Island on Saturday 21 November had an inauspicious beginning with Table Mountain closed because of the weather so we embarked on the city tour. On seeing the swell of the sea at the waterfront Tarlok and I decided not to take the ferry to Robben Island. We had a dinner engagement that evening and didn’t want to risk feeling unwell due to seasickness. As we made that decision quite early on in our day Lauren was able to adapt the tour and took us to see the Boulders Penguin Colony, Cape Point and Cape of Good Hope. In the end we had a great day. Luckily the next morning saw Table Mountain open so I got my birthday wish to ascend the cable car to the top before embarking on the winelands tour. Had we waited another day to go up to the top of Table Mountain we would have been disappointed as the mountain was again closed due to high winds. The mountain and vineyard scenery around Franschhoek and Stellenbosch was stunning and we had fun tasting the wine and cheese pairings. Having seen the seas around Cape Town and Cape Point on Saturday we made the decision not to take the boat based whale watching cruise on the Monday and asked Lauren to cancel that part of the tour. This did not in any way detract from our third day tour to Hermanus. Again, the scenery was stunning. We watched the boats out at sea, there one minute and gone the next lost in the swell just to bob up again a few moments later. I was glad to be firmly on land. Moreover, we were lucky enough to see whales from the seashore! Knowing it was coming to the end of the season I hadn’t been too optimistic about seeing any whales either from sea or shore but we spotted a small group of four to five individuals not too far out from the beach. It was the perfect end to our stay. Again, many thanks to you and your team for helping us have such a wonderful time in Cape Town. Please also pass on our particular thanks to Lauren for making us feel so at ease. We have returned from South Africa, and I wanted to let you know how very much we enjoyed our time with Loryn in Capetown. She was really exceptional. She was so helpful and attentive, and she made sure we saw what wanted at our own pace. Though I had spent a few days in Capetown 5 years ago, I feel that I saw and learned so much more this time. We had terrific days visiting Hermanus, Betty's Bay, the Winelands, Simon's Town, Cape Point, etc., Table Mountain and the City. Our focus was beautiful scenery, and Loryn really delivered! I hope for another return trip some time, and would be very happy to have Loryn guiding again; I will definitely recommend that if any of my friends are planning a trip to South Africa, they contact you. Thank you for the superb arrangements. I want to thank you for arranging our tours while in Cape Town. Our second day with Ronnie was very good. The weather was perfect and we had nice flexibility. Our District 6 and Township tour on Saturday was outstanding. You picked a great guide for us, and he got us to the airport in great time. We are now enjoying our guesthouse in Jeffreys Bay. It's quite special! Thanks again......if ever we are coming your way again, we will certainly contact you! a much better understanding of the struggles endured here. About impressive. And his recommendation for lunch was spot on. Please pass along our appreciation. A quick note to say thanks for organizing. The trip was great although short but we learnt a lot from it. Terrence was exceptional, he made it easy and was pleasant & informative. Will certainly return and with family and more time. Would certainly recommend your firm Terrence the guide. I'd just like to tell you what a fantastic tour we had yesterday. Christian our guide was excellent, his knowledge of the history of South Africa, the flora and fauna and the geological structure of the land was amazing, helped somewhat by the fact that he had been a university lecturer in history prior to becoming a guide. He was interesting and engaging, in fact everything you could want in a guide. We would recommend him and your company without hesitation. I would like to thank you for a fantastic couple of days we spent in Cape Town. The tours were perfect. You organised a perfect guide for us. (Leonard), he was amazingly good. Tour was great. Moses a great guide. Please thank him for returning my phone charger when I left it behind. I wanted to thank you for your excellent service, and let you know how much we all enjoyed our day-long excursion that we booked through your company. The day could not have been better. Our guide/driver, Leonard is the best!! He is so nice to be with, and he had great suggestions to make small adjustments in our day, making everything perfect. So, thank you again for organizing this. Best wishes to you and your company! I just wanted to thank you for arranging our guided sightseeing in Cape Town and the surrounding area. Dion Fabe was an EXCELLENT guide. He was knowledgeable, personable, and professional and we thoroughly enjoyed our time with him in South Africa. I can happily recommend your company to anyone who is traveling to the Cape Town area!! Just a quick note to say thank you for arranging our private tour yesterday. We all had a wonderful day. Braam was incredibly helpful and informative. We will definitely be recommending your company and Braam in particular. We are now leaving Cape Town having thoroughly enjoyed our stay. Thanks very much. Gareth was a fantastic guide, really knowledgeable and also helped keep the kids entertained all day. Thank you for sorting all this out for us. Table Mountain was a phenomenal experience which we will never forget. ​Warren, just wanted to let you know how much we enjoyed visiting the Cape Town area with Brahm. He is very personable, knows everyone in the area, and went the extra mile to meet our needs. This is beautiful land, and the weather really cooperated. You should be proud of your organization, and we will be happy to put in the good word for you. Thanks again for your attention to detail, and for a great experience filled with life-long memories. and you had infinite patience with me. I certainly am going to pass your name on to my colleagues. Again, thank you for making me look good. Apologies for not getting back to you sooner with out feedback. I just want to say how wonderful we found your tours - our first tour to Cape of Good Hope etc was faultless. Brum, our tour guide was very knowledge, fun and great to be around. As a family, we had a truly wonderful day and didn't want the day to end! The private aspect of the tours was beneficial to us as if we wanted to stay at a place for longer, we could. Brum was very good in getting to all the key sites before the buses of other tourists arrived - so thank you for that! I cannot praise the trip enough - I think we would have gone on it again had we had more time because all four of us loved it! The second cultural tour was good too, though we were feeling very tired from the previous day so perhaps didn't enjoy it as much. Also, after visiting one Township we then drove around another two but didn't get out of the car - we though perhaps it would have been better to miss the second two townships out and just spend more time in the first (sometimes driving around in a van for a few hours can be tiring in itself and it would have been nice to have been given the chance to explore some more). We also only spent 20 minutes in District 6 museum - with it being such an interesting site we would have liked to have had more time here to read the fascinating stories. Despite this, we still enjoyed our day. I just want to say a big thank you for accommodating us and organising such well-planned trips. They really did make a difference to our stay in South Africa (and definitely made us was to come back again very soon!). The trip was perfect! I will make provide a detailed review, in the next few days, but it was timed right, guide was incredibly informative and a delight to travel with. I will certainly recommend your organization to friends! Will get round to doing all my reviews when I return. The trip as great. All of the accommodations were first class, especially the guest houses in Oudtshoorn and Hermanus. the guide, Wayne Maddams, from Hilton Ross was rally good. He quickly understood what it was we anted to see and helped us find some new experiences. I will post something on Tripadvisor soon. Peter has been excellent over the last week. I have really enjoyed seeing Cape Town and surrounds. Thanks so much. It was perfect! I had a wonderful time. Bromm was great! I would highly recommend that again. Now that we're home again after a great trip from Cape Town to Victoria Falls, we wanted to thank you for the great day you organised on may 20th. We had a great day on Robben Island and the Cape. Peter Edge is a great guide and also very good company. During the day he teached us many things about South Africa's history and we had some good laughs. Peter liked the sweets we brought from Holland and that's why we want to send him some. Can you provide us with an address where we can send it to? Or perhaps we can send it to your company address and you give it to him? Just sending a message to say how much we enjoyed our tour round the Cape with Estée yesterday. She was very knowledgeable and good company and we had a thoroughly great time. Will you please tell her that we've made a donation to the Nelson Mandela Children's Fund as a thank you for your service. Sad to leave funky Africa but Europe is calling. Just wanted to let you know that despite the antarctic weather condition we had a splendid day at Aquila and Estee was a sweet and knowledgeable travel guide. We connected well and she provided us lots of information of your country. the southern portion of South Africa. We will gladly recommend it to others. Our guide, Luke, was wonderful and very knowledgeable. He did however say that due to the unavailability to visit Table mountain that we would receive a refund for that portion of the tour. Please let me know if this is the case. Just to say thank you for arranging our various tours. Both Glynn and Aubrey were superb guides and excellent companions throughout our journeys. They could not have done more to inform us and they were so conscious to look after mother, who will be 89 next month. If we are able to return to SA again in the future we will, no doubt, be in touch. Brian and Carol Boyden and Mary Myles. Just to let you know that the teachers and kids had a fabulous time! Everything was great, the hotel, the tours and Estée was an amazing and very knowledgeable guide. Luckily the weather was perfect too! Thanks for organizing this for us. I just wanted to let you know that we had a splendid trip around the peninsula with Peter Edge a week ago. He did a very good job and I think you should be proud of working with him. I would appreciate it if you could send me his email address so that I can send him my thanks directly. I hope this email finds you well. I, unfortunately, am back in snowy cold Canada. I just wanted to send a note to you to let you know how much my husband and I enjoyed the time we spent last month with Estee. She was a wonderful guide, very informative, friendly, and we really did feel like friends even after just 2 days together. I wouldn’t hesitate to recommend her (and your company) to anyone visiting Cape Town, and I will recommend you also to my colleagues in the travel biz. Thanks again and have a great year! I wanted to write and thank you, your company and especially your tour guides (Aubrey & Peter) who made our travel experience to Cape Town such an amazing experience. From the outset, I was very impressed by the range of tours you offered and the ease of booking on your website for all 4 tours we conducted (1. Cape Town – Robben Is, Table Mountain, city highlights; 2. Cape of Good Hope; 3. Shark Diving & 4. Day Safari). Your prompt responses also alleviated much of the stress of organising a tour group of 7 largely dysfunctional family members aged from 16 to 75. Everyone has made comment both in South Africa and on return to Australia about how great the tours were. From the convenient pick up and drop off at our B & B, the comfort and quality of the tour bus, the fact the tours were tailored for our small private group only and most importantly the insight, knowledge and sensational commentary from both of our guides- Peter and Aubrey. We will always remember the fantastic time we had in South Africa and much of that positive experience is directly associated with your company, the quality of the tours and your great guides. Just wanted to say thank you so much for our trip to Cape of Good Hope and Penguins on 18th February 2014. I cannot believe I've forgotten the name of our guide! She was so good and her knowledge was immense. I felt sure I'd written her name down but can you, once again, say thank you to her. We had a lovely half day, we were the only 2 at the Cape of Good Hope , hence the early start!! I really enjoyed our 4 days in Cape Town , which wasn't enough time. We will def return and use your company to do some exploring in its surrounding areas. Just wanted to touch base with you and say thanks. Everything you did went great and Peter was awesome. I just wanted to let you know that I had an absolutely wonderful experience. Everyone was on time and held great conversation. It made the travel fly by. I will recommend this service to anyone who is mentioning they are going to our around Cape Town. Thank you so much for all your help. Look forward to seeing you all next year. Back at work now but just wanted to thank you for helping us with the trips. Both of your guides were great. Joanne won’t forget the trip to Robben Island - probably for the wrong reasons (hairy sea crossing!). Sorry it's taken so long, but with the holidays etc. we're just getting back to our usual routine. I wanted to thank you for making our trip to Cape Town such a memorable and positive experience. Both Luke and Mumkali (spelling?) were delightful drivers and guides. Both provided us with a much broader picture of the area from both a cultural and sightseeing perspective. We will certainly be happy to refer and recommend your services to any of our friends who are considering travel to Cape Town. Again, our thanks,as everything from our airport pick-up and drop-off to the tours of the coast, vineyards and Langa went off exactly as planned. Thank you for yesterday.pity about table mountain. It was a real pleasure having Este take us around. Very pleasant and knowledgeable. The kids loved her.she is a brilliant tour guide. I just wanted to tell you that I had a great day yesterday! Cheryl was really great!! I was able to see everything I wanted to see even if we had to follow a tight schedule. Cheryl was able to make it both interesting and enjoyable. I will hopefully come back soon, and this time I will make sure I have more time to explore this great part of the world! We have had an amazing experience here! Thanks so much for all your help in organizing the tours, and thanks for sending us Estee – what a lovely person she is! We enjoyed both of our days with her, and really appreciate her knowledge and enthusiasm for her job! We will definitely recommend Cape Town Day Tours to anyone traveling here, and also write something on Trip Advisor as well. I would like to take the opportunity to thank you for organising a day tour in South Africa a while ago by using your connections. I never got back to tell you just how much I enjoyed the 1.5 day tour I did with your company! Our guide was 'ace' and I saw all I wanted to see with great explanations to boot! So, many thanks. I just found your company on the internet by chance - and bingo, it proved to be perfect. Good luck in your future projects and I will promote your company whenever I can. Just want to say 'Thank you' once again to you and to Luke for the tour I had today. Luke did a great job and I had a wonderful time. I wish all the best to you and Luke. Cape Town is a remarkable city, and hopefully I will visit it again. I just want to say thank you for the excellent service we received from you guys, Estee is a very good tour guide, she loves what she does and has passion for it. I would definitely refer people to you. Thanks again and keep up the good job. I wanted to thank you and especially my guide, Estlee, for a fantastic trip to Boulder's Beach and the cape last week. She really knows her stuff and it was wonderful to have her drive me around to see all the great things that the Cape Town area has to offer. My only wish is that I had more time to see everything but I guess this just means that I have to come back, right? arraigning a great day on the Cape. I back in Germany in the meantime and just wanted to thank you for your immediate and non-bureaucratic help regarding my booking of the day tour last Saturday. I only had the Saturday available for seeing Cape Town, and I really enjoyed the tour! Thanks a lot, I hope to be back next year. Just to let you know we were very happy with the day tour. I would just to thank you for our two wonderful tours in Cape Town. On our first day our guide Luke Oberholzer got us up to Table Mountain and we had fantastic views. It was a real pleasure to find on our tour the next day to Cape Point we again had Luke as our guide. He made it such fun and we were very lucky to be joined on this tour by an Australian couple who were great. Thanks for organising our tours I shall definitely recommend your company for future visitors and if we get back to Cape Town I will know who to get in touch with. It's taken a little while, but just wanted to say thank you for your service whilst we were in Cape Town. It was great to have such reliable transfers to and from the airport and we loved our day excursion around the Cape. We would certainly recommend your company to anyone and everyone. I had a great time! The tour operator was great! Thanks again for sorting out he Robben Island ticket. Was a perfect day to be there and smooth sailing. Thanks also for organizing the Township Tour, I have no hesitations in recommending you or your company to others. If I get a chance and I find you in tripadvisor, I will leave positive comments. I am writing to say a big thank you for the service I received from Cape Town Day Tours. Prompt and organized! I was absolutely thrilled with our guide Estee. Her boundless energy and enthusiasm for all aspects of Capetown (history, geography, architecture, culture, etc...) was a real treat. I will definitely keep contact info and use Cape Town Day Tours again and will heartily recommend it to anyone. Of course, I will be requesting Estee as my guide in the future! Just wanted to say thanks so much for the tours you arranged for us on Monday and Tuesday -- they were even better than we had hoped and our tour guides Hans and Janice were exceptional, both of them made our experience special. 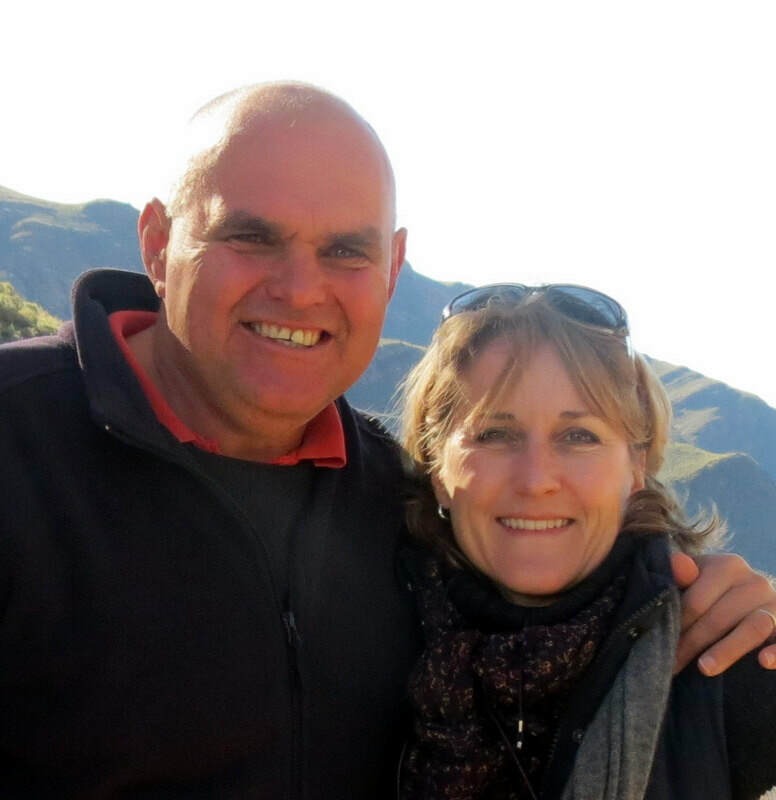 Hans went above and beyond to share his knowledge and personal experience of South Africa and Janice was so flexible and accommodating as to help us see everything we wanted in the Winelands and to get to the cruise ship when our transfer arrangements got missed as a result. We're very much looking forward to our next tour with Cape Town Day Tours on Friday Feb 3rd when the Silver Wind sails back into port. We are back in the US. I just wanted to take this opportunity to thank you for providing us with great service while we were in South Africa. Luke was a great guide and he took good care of us. We look forward to going back to Cape Town soon.